Here’s what you can do to stop collector harassment when a collector won’t leave you alone. Dealing with a debt collector is never easy. Falling behind on a debt is stressful enough. But when a collector crosses the line and starts to harass you, they’re breaking the law. 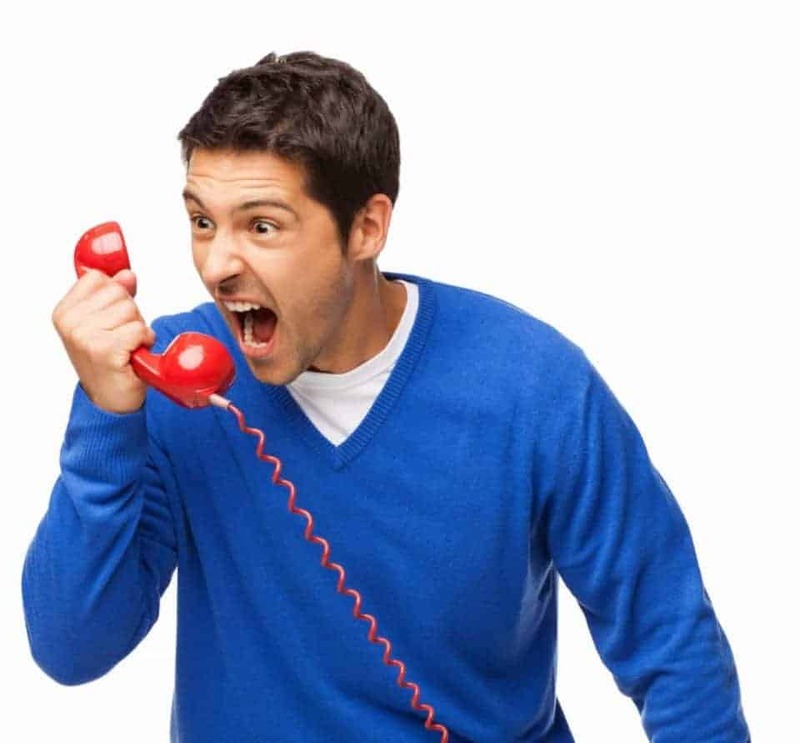 This page teaches you everything you need to know about how to deal with debt collectors. If you believe you’re being harassed, you don’t have to take it! Visit Debt.com’s Solution Center for information on how to fight back. The first step in dealing with a debt collector is to determine if they’re breaking the law. There’s a difference between a collector aggressively pursuing collection and one who’s using illegal tactics to force repayment. The Fair Debt Collection Practices Act (FDCPA) defines collector harassment that crosses the line. Is the collector calling before 8:00 AM or after 9:00 PM? Are they repeatedly calling you throughout the day to an excessive extent? Have you told them not to call you at a specific time and they’ve failed to honor that request? Are they calling your friends, neighbors, coworkers or boss? Have they called your employer to do anything more than verify your identity? Have they threatened you with jail, physical harm or permanent credit damage? Did they try to impersonate a police officer, lawyer or government official? Did they curse at you on the phone or use abusive language? If you answered “yes” to any of these questions, then the collector violated the law! You should report them to the FTC and consider pursuing a civil case to seek damages. Debt collectors can’t pursue you forever. There’s a statute of limitations on how long they can seek collection. So, if you have an old debt that’s nearing the end of the statute of limitations where you live, you may decide not to pay. In this case, you can either try to hide from the debt collector or you can refuse to pay. Hiding means more aggravation. The collector will continue to call and may call your office. They’ll use every tactic available to try to convince, trick or force you into paying. This can go on for years if the collection account is fairly recent. By contrast, you can write a cease and desist letter. This is basically your way of telling the collector you are not going to pay and want no further contact. If you do this, then the collector must stop all contact or they violate the FDCPA. Once you request cease and desist, the only avenue available is for the collector to sue you in court. Some collectors will take this step, while others won’t want the hassle; they’ll simply write off the debt and possibly sell it to someone else. If you decide to repay the debt, then you need to decide how to want to go about it. In many cases, you may be able to get out of collections with a settlement – where you only pay a portion of what you owe. In exchange, the collector discharges the remaining balance. This causes a 7-year negative item on your credit report, but it stops the aggravation of the collection action. If you repay the debt in-full, then the collector may agree to re-age the collection account. They basically report to the agency that the debt was paid as agreed, which may remove the collection account. This can fix the damage caused by collections on your credit report. It’s rare that it happens, but it’s entirely legal for debt collectors to show up at your door. However, they’re still bound by the rules of the FDCPA if they do. So, you need to know your rights. 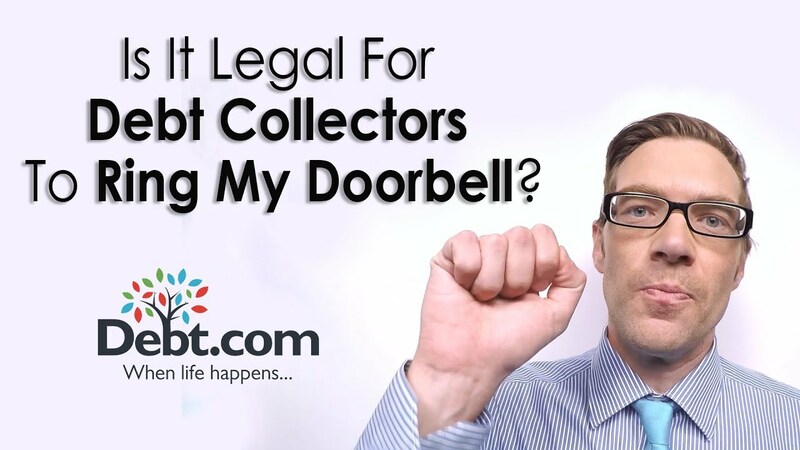 [On-screen text] Is It Legal for Debt Collectors to Ring My Doorbell? Debt collectors are at your door! Is that even legal? Force you to open the door. Enter your home without your permission. Take any of your property to pay off debt. Go to your neighbors and tell them about your debt. Use a megaphone to shout about your debt in your neighborhood. Show up in a police car, or pretend to be law enforcement. In FACT, the law says they have to leave, if you ask them to. Debt.com: When Life Happens. Subscribe to our YouTube Channel and newsletter for updates and news. The first part makes it illegal for debt collectors to pose as police officers, IRS collection agents, or lawyers. They cannot make a collection letter look like an official government form. The second part means they can’t put the amount you owe on the front of the envelope. If you receive any correspondence that you believe violates the FDCPA, make sure to keep it. That way, if you decide to file a harassment suit, you have evidence to prove the collector tried to operate outside the law. Debts that get sold to collectors often pass through multiple hands. Debt buyers end up with incomplete information and then make their best guess about who really owes the debt. This means you may get calls for a collection account that’s not even yours. So, if you get a debt collection call, make sure the debt is yours first. Find out who the original creditor or issuer was and how much they say you owe. If a collector has you confused with another borrower with a similar name, send a cease and desist letter than clearly states the debt is not yours. If you believe an account is not yours to pay, you can check your credit report to make sure it’s not attributed to you. If it shows up on your credit report, then you may have a bigger problem to address. In this case, you may have an alias assigned that’s not really you. You must take this up with the credit bureau that issued the report to get the mistaken alias removed. The FDCPA states that debt collectors can contact you ANY day between 8:00 AM and 9:00 PM, including all holidays. The only thing it prohibits is early morning or late night calls. However, the law also states that collectors must honor any restrictions you place on contact. So, for instance, you can tell them you don’t wish to be contacted on weekends. You can tell them to only contact you in the afternoon. You can tell them not to contact you at work. Take advantage of this part of the regulation and set some ground rules for contact. If the collector continues to attempt contact when you’ve told them to leave you alone, file an FTC complaint. It’s worth noting that the FDCPA also prevents excessive calls within a single day. However, it does not stipulate the number of calls it takes to violate the law. But if a collector is calling you as many times as a jealous ex, you probably have a case to at least make a complaint. If you have a cosigner on an account, be careful about what you do if it goes to collections. Cosigners are liable for your debt if you refuse to pay. So, if you send a collector a cease and desist on a cosigned debt, they’re likely to start contacting your cosigner. This could create stress between you and the cosigner, and you don’t want to ruin a relationship because of debt. If you have a cosigned debt that goes to collections, tell the cosigner so they know about it. You should also chat with them about what you plan to do, so you both can be on the same page. In the end, they may decide to send a cease and desist, too. Then it’s up to the collector to take you both to court. There’s a fine line that the FDCPA draws on employer contact. A collector CAN contact your employer to verify your identity. Basically, they’re trying to match you with the employment information listed in your credit report. A collector trying to hunt you down looks at the employment information listed in your report. If they call that employer and your employer verifies they have someone with your name working for their company, the collector knows they have the right person. However, that’s the only thing a debt collector can do with your employment information. They can’t tell your employer how much you owe or even that you have debt that’s past due. They can’t talk to your supervisor or any of your coworkers. And if you tell them not to contact you at work, they can’t do that either. This part of the FDCPA helps you minimize the potential embarrassment of being behind with your payments. It shouldn’t be something you need to worry about an employer finding out. So, if a collector does anything more than verify your identity, you may have a case for collector harassment. As we mentioned above, most debts have a statute of limitations on collection actions. However, this can be a tricky thing to handle correctly. The very act of acknowledging that you owe the debt to the collector can reset the clock on the collection action. That means you potentially give them more time to chase you. So, unless you intend on settling quickly or paying in-full, do not acknowledge that you owe the debt in any manner. Otherwise, you could be dodging phone calls for an even longer amount of time. Article last modified on March 26, 2019. Published by Debt.com, LLC . Mobile users may also access the AMP Version: How to Deal with Debt Collectors - AMP.